Children’s Dental Health Quiz: True or False? When it comes to young children, many parents unintentionally fall short with their oral hygiene simply because they aren’t aware of the current recommendations. And with tooth decay in youngsters on the rise, children’s dental habits are more important than ever. Test your knowledge below by answering true or false. Are you making common mistakes that other parents are making too? Keep reading to find out what you can do to protect your little one’s oral health. True or false: 42% percent of children from ages two to 11, have had cavities in their baby teeth. According to the CDC, 42% of children two to 11 have had dental cavities in their primary teeth. And even though tooth decay is preventable, it is still one of the most common childhood diseases. If tooth decay is left untreated, it can result in pain, infection or tooth loss. It all starts with proper brushing, click here to make sure you are doing it correctly. 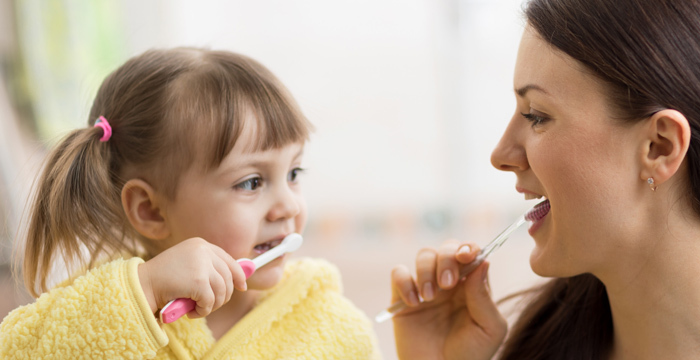 True or false: It’s OK to let your kids brush alone. Now that you’ve read the proper way to brush your teeth, it’s important to supervise your children while they brush. Whether they’re acting more independent, or even if you are trying to teach them to be more independent, they really shouldn’t brush alone until they possess the proper motor skills for effective brushing. This usually happens between the ages of 6 and 9, or possibly when they can tie their own shoes. If you are still unsure, parents should actively inspect their child’s teeth for cleanliness. True or false: It’s OK to give my baby or toddler a bottle in bed. One of the easiest ways to cut back on tooth decay is to never allow your child to sleep with a bottle or sippy cup. Baby bottle tooth decay is caused by frequent and long exposures of a baby’s teeth to liquids that contain sugar, such as milk, formula, or juice. For more tips in preventing baby bottle tooth decay, check out this article here. True or false: Kids should visit the dentist when they start pre-school. The American Academy of Pediatric Dentistry (AAPD) recommends that a child go to the dentist by age 1 or within six months of their first tooth coming in. And unless instructed otherwise by your child’s dentist, a check-up every six months is recommended in order prevent cavities and other dental problems. A common misconception is that baby teeth are not as important as permanent teeth. Yes, they are temporary, but baby teeth are just as significant as permanent teeth. In fact, tooth decay that occurs in baby teeth could lead to oral issues once adult teeth appear. Experts are seeing a rise in cavities and major infections simply because parents aren’t brining their children in soon enough. Learn more about your child’s first dental appointment and tips to help it go smoothly here. True or false: Fluoride isn’t recommended for babies or toddlers. Fluoride toothpaste is recommended for babies (with teeth) and toddlers by the American Dental Association, the American Academy of Pediatrics and the American Association of Pediatric Dentistry. Unless recommended otherwise by your dentist, the ADA recommends that once the first teeth start coming in, you should start using a fluoride toothpaste. Fluoride protects teeth to make them stronger from the bacteria and food beverages your children consume. For guidelines and more information on fluoride, click here. Want to brush up more on your child’s dental health? Click here for some of our frequently asked questions.